If you’ve been following my financial freedom updates, you’ll see that I’m a fan of global index ETFs (ex-Canada). Two of my favorites are XAW from iShares and VXC from Vanguard. I like them because they provide diversified exposure to the largest companies in the world (outside Canada) through a single ETF, they are on the Toronto Stock Exchange (TSX) which means they trade in Canadian dollars (CAD), and they have relatively very low management expense ratios (MER). Both have similar global coverage, but I like XAW little more because it’s slightly cheaper 0.22% MER vs 0.27%, and it’s slightly more efficient in an RRSP with regards to withholding taxes (a topic for another day). For a more comprehensive portfolio, you can view my simple index ETF portfolios here. If you are a U.S resident, you can view a recent article on a super easy indexing solution with Vanguard. I like XAW so much in fact that it’s a dominant portion of Mrs. FT’s RRSP. It’s a simple all-in-one solution for indexed global exposure to the markets (outside of Canada). We have plenty of Canadian exposure held within TFSAs and our non-registered joint dividend portfolio accounts. Overall cost: 0.22% or $22/year/$10,000 invested. Are Three ETFs Better than One? Overall cost: Assuming 55% U.S, 35% MSCI International, and 10% Emerging Markets, the portfolio MER of using three separate ETFs would be: 0.14% (or $14/year/$10,000 invested). Although there is 0.08% savings by using 3 ETFs instead of a single XAW, there is the trade off of having to rebalance the portfolio yourself to maintain percentages of each index (55%/35%/10%). As you can see, if you buy the super convenient XAW, you are looking at a MER of 0.22% which is $22 per $10k invested per year. Not too bad! If you break up XAW into individual ETFS with appropriate proportions, the portfolio MER would be about 0.14%, about a $8 savings per $10k invested. Not a big deal if you have $10k invested, but a portfolio worth $100k it’s $80 savings annually, $500k it’s $400/year, and $1M it’s $800/year. Again, very small relative numbers, but it can be significant savings depending on the size of your portfolio and your investment timeline. To shave costs even further, you could pick a discount broker with commission-free ETF trading, which would save you about $10 per buy or sell. 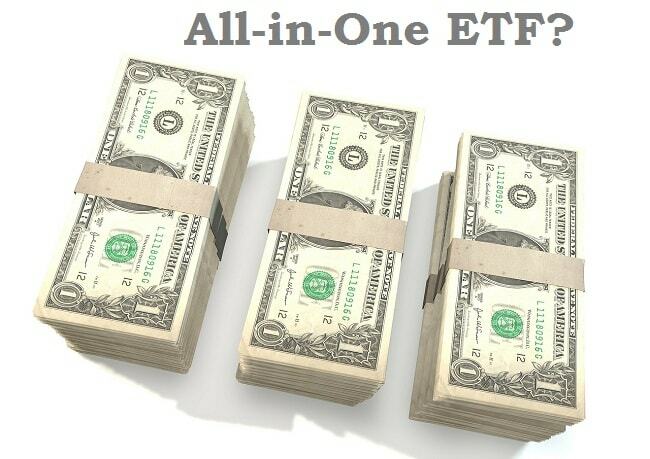 As Mrs. FT’s portfolio gets larger, I may initiate the move from a single all-in-one ETF to separate individual ETFs. For ETF investors, what are your thoughts on XAW vs individual ETFs? If you have a look at which shares XAW is invested in (link below) you will see that beside CAD and USD cash all shares are other iShares ETF’s. I would think that each of the iShares ETF’s have their own MER percentage and that BlackRock is adding the 0.22% MER on top of for the XAW ETF. So maybe your calculation should include all MER’s and then you could make the conclusion that is better to buy the individual ETF’s yourself. Keep up the good work, I have been following you for years. You seem to misunderstand what the 0.22% is. Never noticed that! Math checks out, looks an extra 0.10% MER or so convenience fee, good to know. The only sad thing about these Canadian ETFs is that they invest in underlying US situs ETFs from the same fund family. So level 2 taxes are not recoverable for us. We really need domestic ETF manufacturers to step up and create funds that invest directly in the underlying securities for better tax efficiency. Hey, I’ve wondered about fee’s on these wrapper ETFs holding other ETFs from the same company. Does the MER reflect a) the combined MER’s of the underlying ETFs, b) the wrapper ETF’s additional fee on top of the individual MERs of its holdings, or c) the wrapper ETF is exempt from fees on its holdings from its own company or something? I’ve always assumed it’s b, and that the overall MER would be higher than .22% for a wrapper like XAB that holds 5 etfs. I think either you’re confused or I’m confused about foreign withholding tax consequences in an RRSP and when they can be recovered/avoided. I’ve been using VTI and VXUS in my RRSP for this reason, which I would happily replace with a cheap single ETF if I could, however I don’t believe XAW is the answer if this is y(our) objective. I believe these ETFs have to be US-listed ETFs, do they not? I remember reading that buying a CAD-listed ETF of US/International stocks would not be sufficient. Which, sadly, necessitates the need for Norbert’s Gambit (otherwise paying a 2.5% currency conversion fee). I did this with my lump-sum contribution when I opened my RRSP, but it’s become too costly/cumbersome to do this with every amount I contribute going forward (usually only a few hundred dollars at a time). If you bring up this subject in a future blog post I would love to know whether i) if my premise is true and you would require VTI over XUU in order to recover foreign withholding taxes, then ii) when is it not worth it? If VTI is 0.05% and XUU is 0.07% considering the expense of currency conversion fees and/or Norbert’s Gambit, is it significant enough to warrant the trouble. Because the cost of VTI (US listed) and XUU (CAD listed) are marginal now….. Perhaps we can ignore International funds, just to keep things straight and simple for the analogy to hold up. Craig, you are right, the ideal situation is VTI and VXUS, but that also means you need to find a way to perform efficient currency conversion. Norbert’s Gambit is one way, but that it’s only relevant for larger cash conversions not to mention complicated for most. But good suggestions on future posts, I will take a look. I don’t think I’m paying a 2.5% currency conversion fee at TD Direct Investing on webbroker. I’ve compared the rate with xe.com, and it’s a fraction of a percent difference. It’s also much better than the so-called preferred rate at the bank. Apparently, if it’s a large amount, you should call them and get an even better rate, but I have not tried that. cibc investor’s edge converted cad/usd for 1.25% last time I exchanged a small amount ($3k or so). norbert’s costs 6.95 x 2 there and is pretty easy once you’re comfortable with the process. so, nortbert’s is more expensive below $1200 or so. I’m rebalancing once a year and batching contributions by taking an rrsp loan each year. this is working so far to give me a large enough sum to norbert. So why not use scotia iTrade for buying US stocks. The only cost is $30.00 per quarter…no percentage taken. 1. XAW is more efficient in a TFSA as well as an RRSP. The international stocks are held directly instead of through a US ETF which leads to 1 less level of foreign withholding taxes which means 15% less tax on any dividends from those stocks. In a non-registered, you can recover the foreign withholding tax on both VXC and XAW. 2. You shouldn’t hold VEE and XEF together. Either do XEF/XEC or VIU/VEE. If you do VEE and XEF, you have no exposure to South Korea. The Vanguard and iShares indicies have different definitions as to whether or not South Korea is developed or emerging. 3. You might want to rebalance these which leads to extra trading costs and possibly capital gains, so XAW would likely be preferable. 4. In RRSPs, it’s much better to use VTI+VXUS than XAW. This is a great summary EngPhys, thanks for taking the time to summarize. I also didn’t notice the South Korea exposure issue, very good point. My current TFSA portfolio is XAW, VCN and VSB, the triple ETF strategy, but thinking of opening an RRSP and was going to use the same triple combo, but wondering about your comment. If I understand correctly, I believe you’re suggesting this because the VTI and VXUS are both USD ETFs with a cheaper MER and from a tax perspective they are better off in an RRSP since you cannot recover the tax lag (15% withholding tax) in a TFSA? Its amazing how those fees add up even when its just tenths of a percent. Personally I’ve got a similar exposure with three different funds. At the moment I’m still able to rebalance with new contributions/dividends so the trading fees are minimal. But if I was just starting out investing this would be a great option. One thing to note is that by doing this you’ll have exposure to the MSCI EAFE International Index but the FTSE Emerging Markets Index. I think you’d miss out on exposure to Korea, UAE, and Pakistan. Thank you. I didn’t know XEF. For an all-in-one ex-Canada ETF, XAW is the best one out there currently. I would stay away from ZWE – lower diversity, high fees, high dividends (this means high foreign withholding taxes) and playing with covered call strategies. Also, XIU is the TSX 60 with an MER of 0.18. You can get essentially the same thing with VCE and an MER of 0.06 – however, the TSX capped composite would be more diversified: XIC with an MER of 0.06. I’ve been reading a ton for the last year or so, and slowly making changes to my portfolios, but I’ve frozen when it comes to actually making the switch to ETFS. I’ve finally opened up a questrade account, and I think I’ve decided to purchase XAW and XIC ,but I’m not sure how I should be allocating my money? 80/20.. or 85/15 respectively. I know these figures mean little in the long run, and I should really just buy them now, but choosing the funds and allocations has really just become overwhelming. Any advice? I live in Canada, I’m young and don’t want bonds, this is for a TFSA and I’m investing about 50k – thanks in advance! Like you said, it will make little difference in the long run. Personally, I’d be closer to 20% Canada. Another option that you may want to consider are the new Vanguard ETFs, VGRO and VBAL. They are especially useful if you plan to have bonds in your portfolio (now or in the future). Like you said, I’ll probably switch to VRGO at some point down the road when I want to adds some safety with bonds.